Accepting Registration For Classes Now! People need to earn a GED® for a lot of reasons, and we know yours is very important. Our classes are designed to meet your needs, and our instruction will be focused where you need help. Our classes are interactive, utilize technology, and are offered at our campuses and community partner sites to provide you access no matter where you live. Are you interested in helping someone earn their GED? For a donation of only $160, you can provide a scholarship for a student in need for all four parts of the GED test. We make sure your donation gets to students who are ready to pass the test but cannot afford to take it. 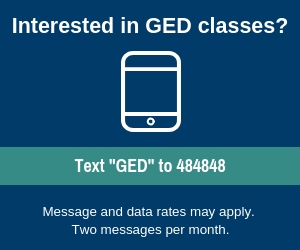 Click the “Donate” button below and make sure you add “GED test scholarship” and/or other information to the “Add special instructors to the seller.” Our students appreciate your generosity. Please also see our Donor Bill of Rights. At most of our locations, new students can begin classes every month. Select the county below nearest to you for specific registration information.